It’s also not all about work-life balance. While economic research and previous survey findings have shown that career interruptions related to motherhood may make it harder for women to advance in their careers and compete for top executive jobs, relatively few adults in the new Pew Research survey point to this as a key barrier for women seeking leadership roles.1 Only about one-in-five say women’s family responsibilities are a major reason there aren’t more females in top leadership positions in business and politics. When it comes to characteristics that apply specifically to political and business leadership, most Americans don’t distinguish between men and women. But among those who do draw distinctions, women are perceived to have a clear advantage over men in some key areas. Political compromise has been in short supply in recent years, particularly in Washington, DC. Many adults (34%) think that female politicians are better at working out compromises than their male counterparts. Only 9% say men are better. A narrow majority (55%) say there’s no difference between men and women in this regard. Women are also perceived to have an edge over men when it comes to being honest and ethical (34% say women are better at this; 3% say men are better at it). Women have a somewhat narrower advantage over men when it comes to working to improve the quality of life for Americans and standing up for what they believe in despite political pressure. For both of these characteristics, solid majorities say there is no difference between men and women. 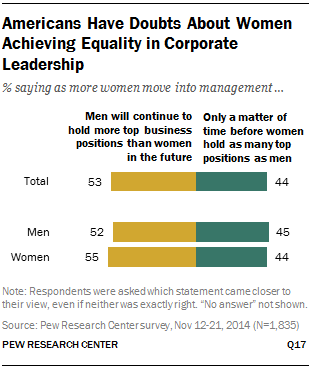 Just as in the political realm, the public does not see major differences between men and women on key business leadership qualities. Where they do see gaps, women have a clear advantage over men on honesty and ethics, providing fair pay and benefits, and offering mentorship to young employees. Men have an edge when it comes to being willing to take risks and negotiating profitable deals. The pipeline for female leaders seems to be widening. Women have made significant gains in educational attainment in recent decades, better positioning themselves not only for career success but also for leadership positions. Since the 1990s, women have outnumbered men in both college enrollment and college completion rates, reversing a trend that lasted through the 1960s and ’70s. And women today are more likely than men to continue their education after college. For women, the issue of having more female leaders goes far beyond equality in the workplace. Four-in-ten of them (38%) say having more women in top leadership positions in business and government would do a lot to improve the quality of life for all women. An additional 40% of women say this would have at least some positive impact on all women’s lives. 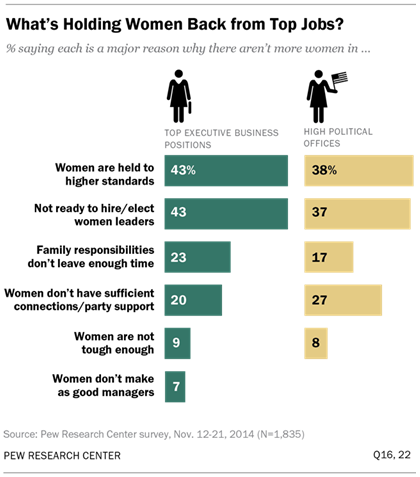 For their part, men are less convinced that female leadership has such wide-ranging benefits. Only 19% of men say having more women in top leadership positions would do a lot to improve all women’s lives, while 43% say this would improve women’s lives somewhat. When it comes to the barriers that may be holding women back from achieving greater representation in the top leadership ranks, women are much more likely than men to point to societal and institutional factors such as the country not being ready to elect more female political leaders and women being held to higher standards than men in business and in government. Women are also more likely than men to say that female leaders in both politics and business outperform male leaders on most of the traits and characteristics tested in the survey. 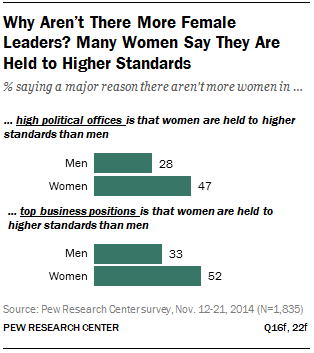 The gender gaps in perceptions about political leadership are especially sharp. Whether on compromise, honesty, backbone, persuasion or working for the benefit of all Americans, women are more likely than men to say female leaders do a better job. For their part, solid majorities of men say there aren’t major differences between men and women men in these areas. Nonetheless, they are somewhat more likely than women to give a nod to male leaders over female leaders on four of the five political leadership qualities tested in the poll. Those who identify with the Democratic Party, which dominates the ranks of elected female leaders at the federal and state levels today, also have more favorable impressions of the women who serve in leadership positions in government and in business. When it comes to political leadership, Democrats are significantly more likely than Republicans to say that women do a better job than men on each of the attributes tested in the poll. For their part, Republicans are not necessarily more likely to favor men in these areas, but they are more inclined to say there isn’t any difference between men and women. Democratic women in particular are strong proponents of female political leaders. In most cases, they are more likely than both Democratic men and Republican women to say that female political leaders do a better job men. Democratic women are also among the most enthusiastic about the possibility of having a female elected as president. As Hillary Clinton weighs another run for the White House in 2016 and progressive groups urge Elizabeth Warren to get in the race, 38% of all adults say they hope the U.S. will elect a female president in their lifetime; 57% say it doesn’t matter to them. Among Democratic women, fully 69% say they hope the U.S. will elect a female president in their lifetime. This compares with 46% of Democratic men, 20% of Republican women and 16% of Republican men. To be sure, for many Republicans this view may be more about the prospect of a Hillary Clinton presidency than about a major milestone for women, a perspective that likely influences the way they respond to this “hypothetical” question. The remainder of this report examines the current landscape of women in leadership in the U.S. and the public’s views on this topic. Chapter 1 lays out trends in female leadership in elected political office and in corporate America, as well as changes in the pipelines to top leadership positions. Chapter 2 looks at public attitudes on men, women and key leadership traits in both the political and business realms. And Chapter 3 explores the obstacles to leadership for women, as well as views about discrimination and the future of female leadership. Women are far more likely than men to see gender discrimination in today’s society. About two-thirds (65%) of women say their gender faces at least some discrimination in society today, compared with 48% of men who believe women face some discrimination. A double-digit gender gap on perceptions of gender discrimination is evident across all generations as well as across partisan groups. Women and men are seen as equally good business leaders, but gender stereotypes persist. Most Americans (54%) say men would do a better job running a professional sports team, while just 8% say women would be better at this. And a 46% plurality also give men the edge when it comes to running a large oil or gas company. But the public is two and a half times more likely to say a woman, rather than a man, would do a better job running a major hospital or a major retail chain. Young adults are more likely than older generations to say women with leadership aspirations might want to delay having children. 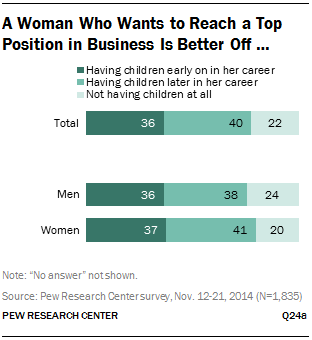 More than four-in-ten Millennials (46%) say a woman who wants to reach a top position in business is better off waiting to have children until she is well established in her career, while 29% say she should have children early in her career. By contrast, four-in-ten Boomers and nearly half (48%) of members of the Silent generation say it’s better for a woman with high-level business aspirations to have children early on. Among partisans, Republican men are the most likely to say the country has taken the steps needed to achieve gender equality in the workplace. About half of Republican men (54%) say the country has made the changes needed to give men and women equality in the workplace. By contrast about two-thirds (66%) of Republican women say more changes are needed. Even larger majorities of Democratic and independent women and Democratic men agree that gender parity is still a work in progress. Some of the analysis in this report looks at adults by generation. While the definitions of generations can differ slightly among researchers, this report relies on the following standard Pew Research definitions. Generation X: born from 1965 to 1980, ages 34 to 49 in 2014. Baby Boomers: born from 1946 to 1964, ages 50 to 68 in 2014. This report explores public attitudes about gender and leadership with a particular focus on leadership in U.S. politics and business. The analysis is based on two new Pew Research Center surveys. The main survey was conducted Nov. 12-21, 2014, among a sample of 1,835 adults – 921 women and 914 men – 18 years of age or older. The survey was conducted by the GfK Group using KnowledgePanel, its nationally representative online research panel. A second survey was conducted Nov. 20-23, 2014, among 1,004 adults, 18 years of age or older, living in the continental United States. This survey was conducted over the telephone (landline and cellular phone) under the direction of Princeton Survey Research Associates International. For a more detailed description of the survey methodology, see Appendix A. In addition to the surveys, this report draws on data from a variety of sources to document women in leadership positions in politics (national and state levels) and in business with trends over time. This report is a collaborative effort based on the input and analysis of the following individuals. Claudia Deane, director of research practices, and Rich Morin, senior editor, provided editorial guidance. Kim Parker, director of social trends research, and Juliana Menasce Horowitz, associate director of research, designed the surveys and wrote the overview and two main survey chapters. Wendy Wang, senior researcher, and Anna Brown, research assistant, compiled the data for the chapter on female leadership. Wang wrote the chapter on female leadership. Brown and Eileen Patten, research analyst, number-checked the report. The report was copy-edited by Marcia Kramer of Kramer Editing Services. Michael Suh provided Web support. Find related reports online at www.pewresearch.org/socialtrends.